After the holidays are over, the winter blues can really start to set in. Luckily, January is National Thank You Month, and a little gratitude can go a long way in the workplace. The start of a fresh new year is often stressful for employees, trying to catch up from vacations, solidifying strategic plans and conducting annual reviews from the year prior. This is actually the perfect time for managers to take a step back, observe the accomplishments of their teams over the past year and think of creative ways to reward a job well done. Most importantly, when employers make a point to take this time to show their staff how much they care, employees will be happier, more engaged, productive and driven to perform. There may be no one who was better at saying “Thank you, thank you very much” than Elvis Presley himself. Coincidentally, January is the birth month of the King, who should remind leaders everywhere that a nice “thank you” never goes out of style. Here are some simple steps that managers can take to show appreciation for current employees and publicize that recognition to attract more great hires. Modern work culture is fast-paced, mobile and demanding. It’s easy to get burned out if employees are held to tight deadlines, pressured to work long hours and never truly unplug. When spending so much time and energy dedicated to work, the benefits of a strong manager/employee relationship cannot be understated. Employees feel most valued when their bosses show a personal connection to them and their work. It could be as simple as spending some time together. Take them out to lunch or coffee, get out of the office for a few hours. During that one-on-one time, take care to listen to their wants, goals and stressors. Review and discuss projects they’ve worked on, then follow through to the best of your abilities to help make their jobs easier and more rewarding. With direct in-person conversations, or at least a very thoughtful handwritten Thank You card, they’ll understand that you are focused on helping them succeed instead of just assigning work to be done. Nothing is more meaningful in any relationship than trust. As important as verbal acknowledgement is, showing someone that you trust their opinion and expertise is far more valuable in the long run. Reward employees for a job well done by allowing them to take on more visible projects with autonomy, if their workload allows. Or request that they highlight a finished project by sharing it with the department or company at large. When you ask someone to share their methods, tips, and results with others it provides validation that they have something of great value to offer. The boost to their self-confidence will encourage them to continue to shine in their role and have a true impact within the company. If you have the budget, gift cards, bonuses or other perks are surely appreciated and provide a strong incentive. Nonetheless, you may be able to add even more value for both the individual and the company by investing in other activities, including team-building challenges, fully-paid continuing education courses, or business retreats which offer a healthy combination of training and R&R. If your budget is more limited, unexpected small treats like donuts for breakfast or a surprise day off are also great ways to show thanks. 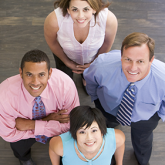 Happy employees are one the best drivers for great hiring. Employee referrals are widely known to the strongest resource for finding best-fit talent that is well positioned to succeed within in the organization long-term. In fact, 76 percent of job seekers value current employees of a company more than any other job search resource. This is one of many reasons to encourage employees to show gratitude and give praise to one another, and for managers to praise employees publicly when possible on corporate-friendly social media channels. Remember, fostering—and promoting— a culture that attracts and cultivates the best and brightest often starts with the simplest signs of gratitude.